The testimony is the title; and the title, the testimony. That says a lot. What also says a lot is that these words are from returning guests and that, perhaps, is the greatest testimony of all. And by “returning guests,” we’re not talking about folks returning to us from last year. Not last season. Not even last month. 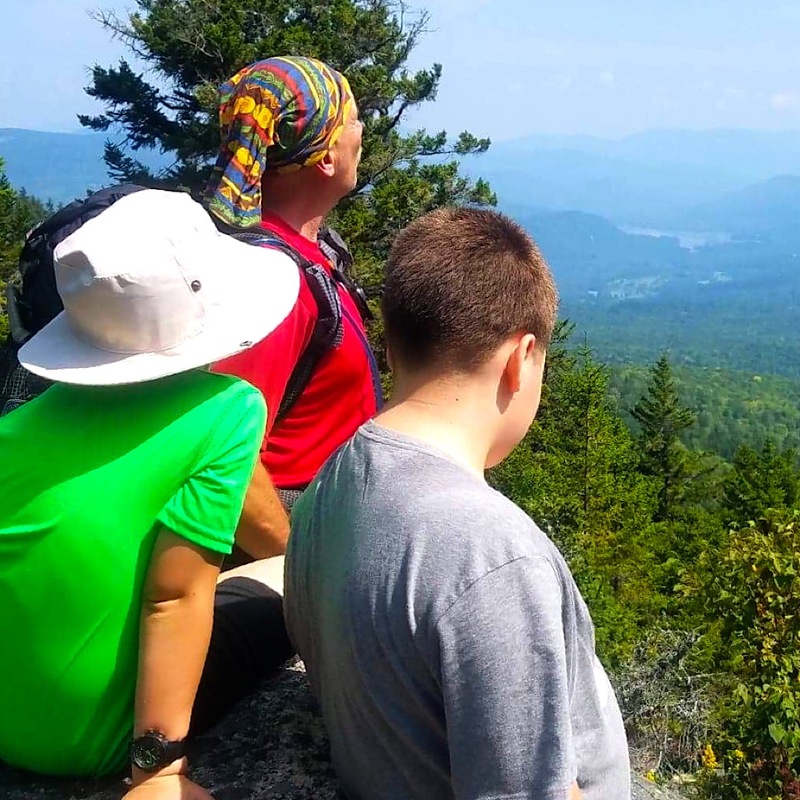 This trio of now-addicted hikers first came to us just days ago for a half-day nature tour at the start of their vacation. They had such a terrific experience with Redline Guide Ken Hodges last time, they signed up again, this time for a full-day hike. And as it turned out, when asked, they stated these experiences proved to be the best part of their vacation. To be, in other words, the best of an already good thing. We’re gushing. 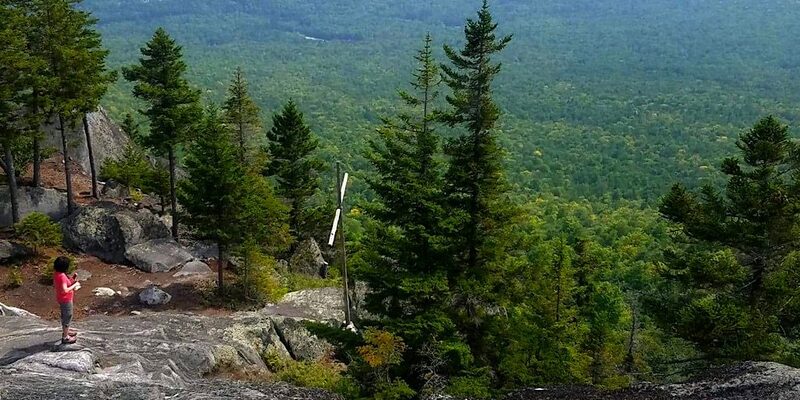 After careful consideration, we decided Pine Mountain in Gorham, NH, would be a fun destination. It offers a lot of variety, a lot of bang for the buck, so to speak, and with easier access at this time of year due to Pinkham B Road being passable, the goods are even easier to get. So getting the goods they did. 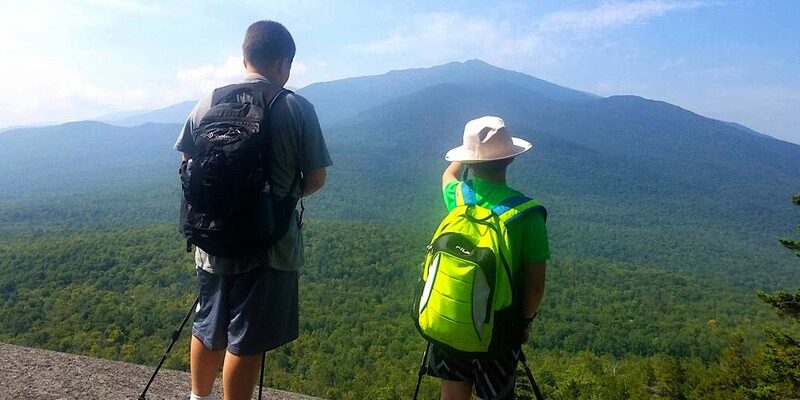 As before, Ken led brothers Jonny (8) and Julian (12) along with their “Noni” or grandmother on this adventure. Ken, being grandfatherly, cajoled the boys, egging them on, poking fun, all while teaching them some of what they need and are craving to know about our world in nature, much to the delight of their Noni. 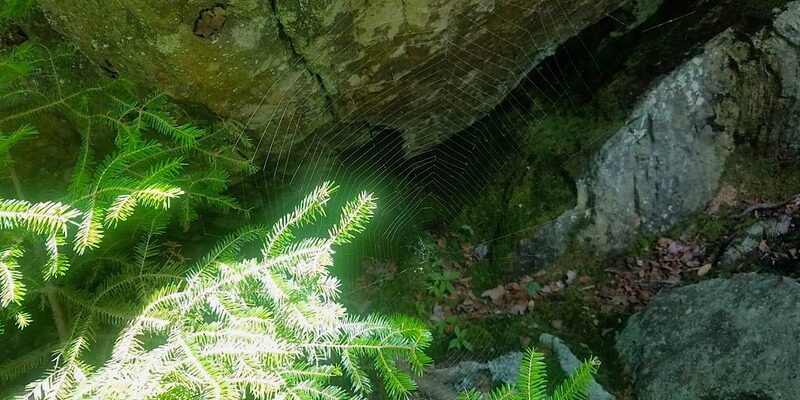 This wasn’t a nature tour, per se, but the lines are always blurred because we always grasp and use teachable moments offering insights into the surroundings, flora and fauna, conservation, leave no trace, and more. It’s what we do — with enthusiasm. 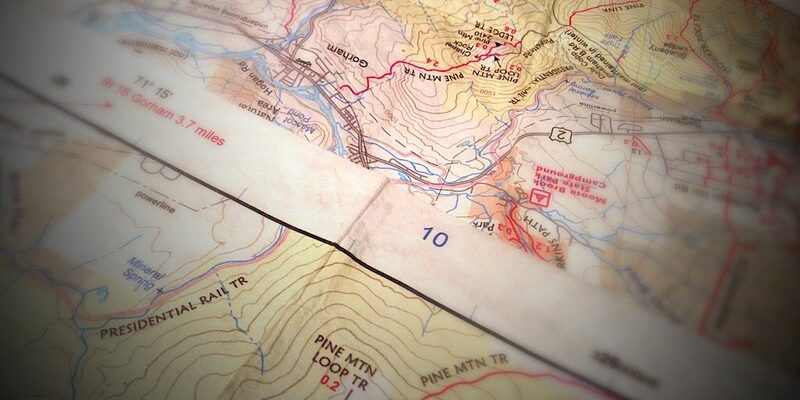 We spend a lot of time picking and planning our hikes, trying always for that best match. That best experience. The route was straight forward. Park and do a minor road walk on Pine Mountain Road, which provides private vehicular access to The Horton Center, before diverting onto the actual hiking trail aptly named Ledge Trail. From there it became work as they pressed hard upward on the steep trail. Their hard work soon paid off, though. 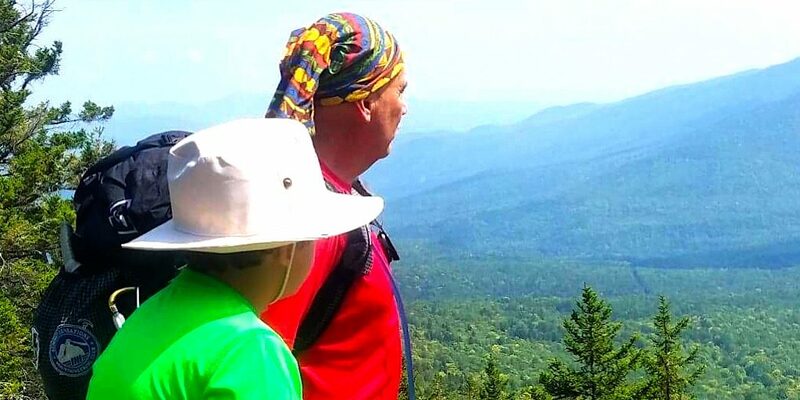 As soon as they got to the first open ledges they were able to enjoy some hazy but still incredible views, most notably of the northern end of the Presidential Range. 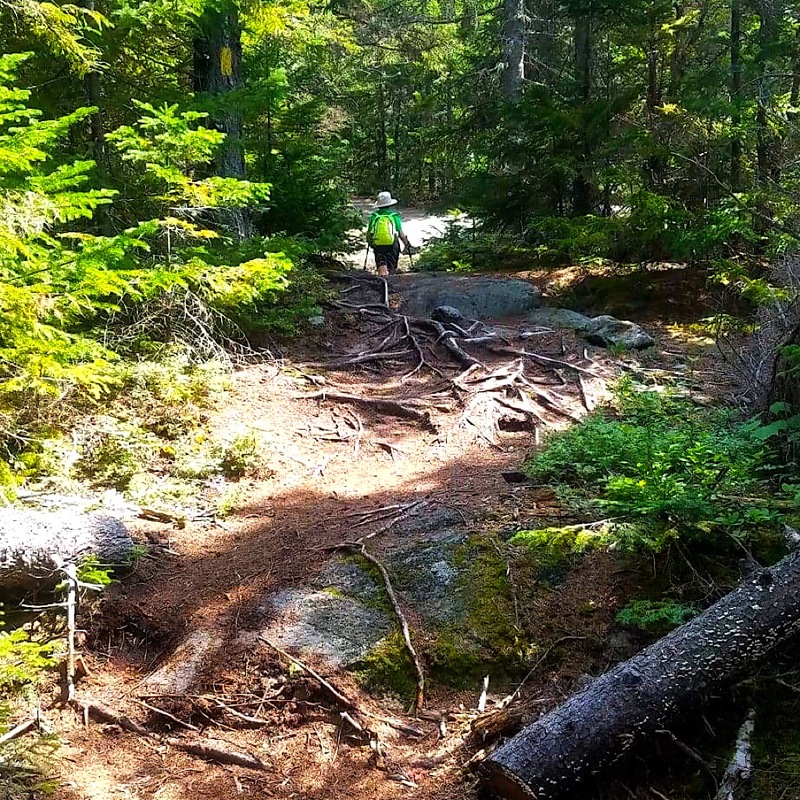 After a respite on the ledges they reentered the woods surrounding Pine Mountain’s actual 2410′ summit marked by the footings of an old fire tower. Continuing on the Pine Mountain Trail after their ascent of Ledge Trail they admired some of the various signed outlooks. One features an Adirondak-style lean-to shelter so it was there they enjoyed lunch. The Pine Mountain Ledges provide a stunning panorama. That’s Mt Madison! 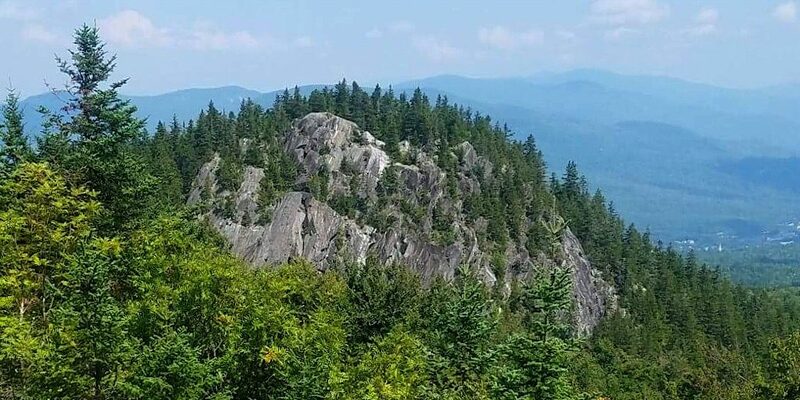 After a nice rest and enjoyable lunch they continued onto the col between the Pine Mountain summit mound and that of “Chapel Rock.” There they investigated the climbing walls before heading up themselves — using the path, of course. More time was spent on Chapel Rock taking in the views before Ken turned everyone around making their exit via the Pine Mountain Loop Trail which bypasses the actual religious camp. Before long they were back on the road and with gravity now working in their favor made good time. Such good time, in fact, that Ken decided everyone should stop at a favorite fishing and swimming spot in the general area. 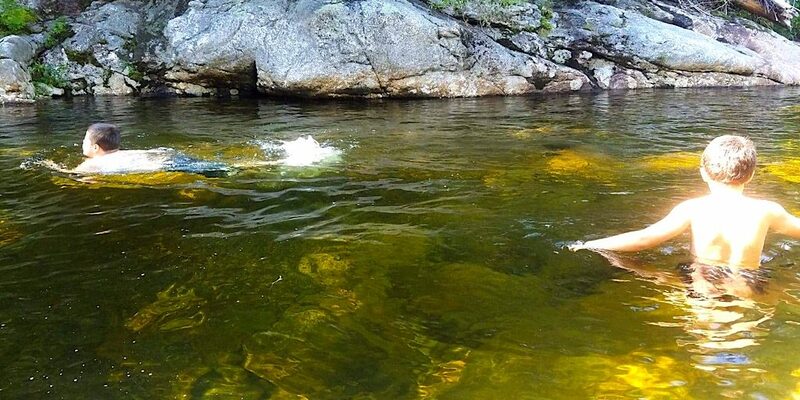 There the boys swam and cooled themselves. That is until one found a leech on himself. Ken took it off for the lad, no harm done, but that was that. The swimming was done, needless to say. The memories, however, will last. What a wonderful day. Ken told us how much he enjoyed being their guide. The mound on which Chapel Rock is perched. Ken shares a swimming hole. The delight is as clear as the water. Until a leech says hello. At the end of the day, back in the car, Noni smiles and thanks Ken. Jonny and Julian crawl into the car with her, wave goodbye to Ken, also all smiles, and promptly drift to sleep, happily spent from the long, exciting day. Congratulations team on making the summit and having a safe, enjoyable hike. Great lead, Ken.